If you don't want a design on the front of both glasses, you can ignore this section. This set of a personalized pint glass and shot glass is a classic and timeless choice. Both glasses can be engraved to your specifications. 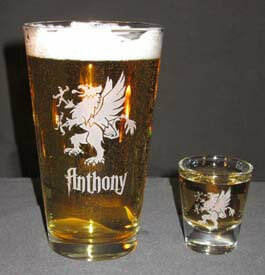 The pint glass is 16 ounces and 6 inches tall and the shot glass is 1.5 ounces and is 2.5 inches tall. The personalization can be different on each glass if you like. We suggest keeping your text to 4 lines of 18 characters per line for the Pint Glass and 2 lines of 15 characters for the Shot Glass, it is okay to go over, it may just be smaller to fit it on the glass.